When we did the car themed magnet tray, I was surprised to see how excited two year old K was about it. Since he was so into it, I have created a few other magnet trays for the boys, including this music themed invitation. This tray may have been more popular than the car one. And, as you will see, the tray lead to more than just learning about magnets. The Musical Instruments TOOB was provided to me by Safari Ltd.. All opinions expressed are my own and are not influenced by the free product. Black pom poms and dot magnets - These represent staccato notes and dotted notes. Trumpet mouthpieces - The boys have had a blast with these before. Strips of black and white magnets - These represent the keys on a piano. To make the white keys, I simply covered a fridge magnet with white cardstock and then cut it into strips. Pipe cleaner music symbols - As you can see below, I made quarter notes, eighth notes, a treble clef, and a bass clef. To make these, just twist the pipe cleaners into the shape that you need. 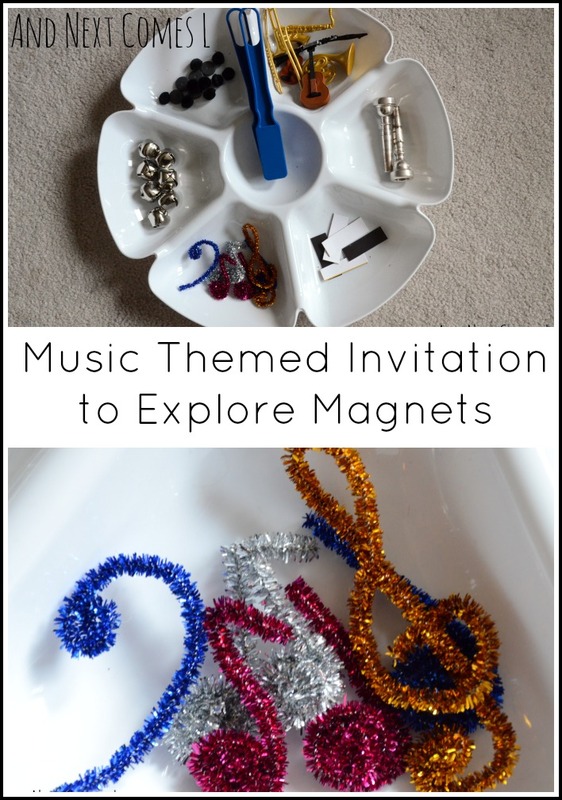 The musical instruments are always a hit when we play with them and this magnet tray was no exception. K first pretended to play the French Horn. Clearly, he has not figured out the proper technique since last time, but he's getting there! He also pretended to strum the guitar while dancing. It was ridiculously cute. Even J played along, trying to play the trombone. K had little interest in the magnetic tray after playing with the instruments, both real and fake. J, on the other hand, took the time to see what items were and weren't magnetic. J then started arranging the piano key magnets into a piano and pretended to play it like a real piano. Well, if you are J, who is obsessed with all things numbers, then you see "2, 2, 9, 9, 6, 9." Never in a million years would I have seen numbers in those music pipe cleaners. I am extremely fascinated by how J's mind works. He continues to blow me away.